President Recep Tayyip Erdoğan said on Friday that the election processes in local polls across Turkey were now over and it was time for the judicial process in comments on objections to results in both Ankara and Istanbul after Sunday's elections. While in many provinces election results have been smoothly declared, in Istanbul, where a tight race took place, the case is not the same. There have been reports of irregularities and suspiciously unregistered votes by the parties, leading to a recount of invalid votes all districts and a recount of all votes in three districts, according to city and district electoral councils. Among the districts of Istanbul, the Justice and Development (AK Party) led in 24 district municipalities, which cover 62 percent of the population in Istanbul. While the Republican People's Party (CHP) led the polls in 14 districts, one district will be ruled by the Nationalist Movement Party (MHP). However, unofficial results showed Nation Alliance candidate CHP's Ekrem İmamoğlu leading in the mayoral race for Istanbul Metropolitan Municipality by 22,000 votes against People's Alliance candidate AK Party's Binali Yıldırım. In total there were 10,570,939 eligible voters and voter turnout was 83.88 percent. Out of nearly 9 million votes however, some 230,000 were decided invalid votes, found to be mainly in districts considered to be AK Party strongholds. 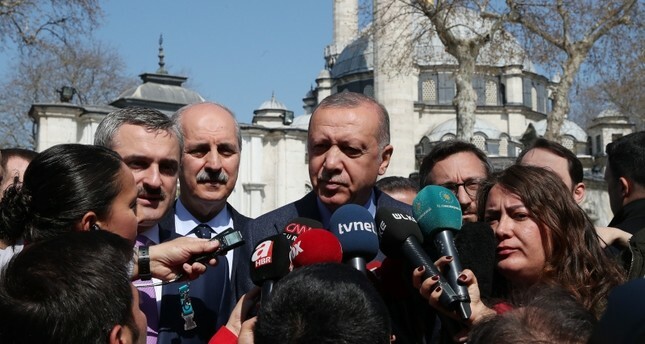 Speaking to reporters in Istanbul, Erdoğan said the results will now be re-evaluated in three stages, first at the district level and then provincial, before the YSK announces the ultimate outcome. On a separate note, the president also answered questions about his scheduled visit to Russia on Monday, April 8 and Ankara's relations with Washington, which have taken a sour turn ever since Turkey decided to buy Russia surface-to-air missile systems from Russia. Erdoğan said Turkey was continuing to make payments under its deal with Russia to buy S-400 missile defense systems and the United States had not presented the same terms when it offered to sell Patriot missiles. "The S-400 holds an important place in our talks. The United States' arguments are very wrong. We finished the S-400 process and our payments continue," he said. The U.S. announced Monday that it would be suspending all "deliveries and activities" related to Turkey's procurement of a jointly-developed stealth fighter jet over Ankara's plans to purchase the Russian system.